The days are really flying by it seems! It’s time to start planning for Valentine’s Day already. Every year, my husband and I enjoy a dinner at home on Valentine’s Day-it’s much more romantic than being in the middle of a crowded restaurant. We save the dinner out for the weekend following the 14th. 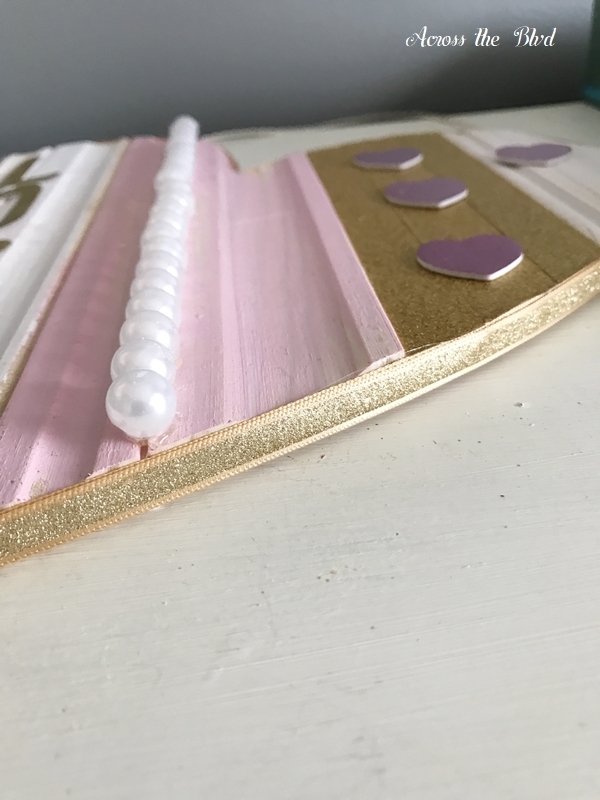 This year, I decided to go with white, pink, blush, and gold for our Valentine’s Day Decor. 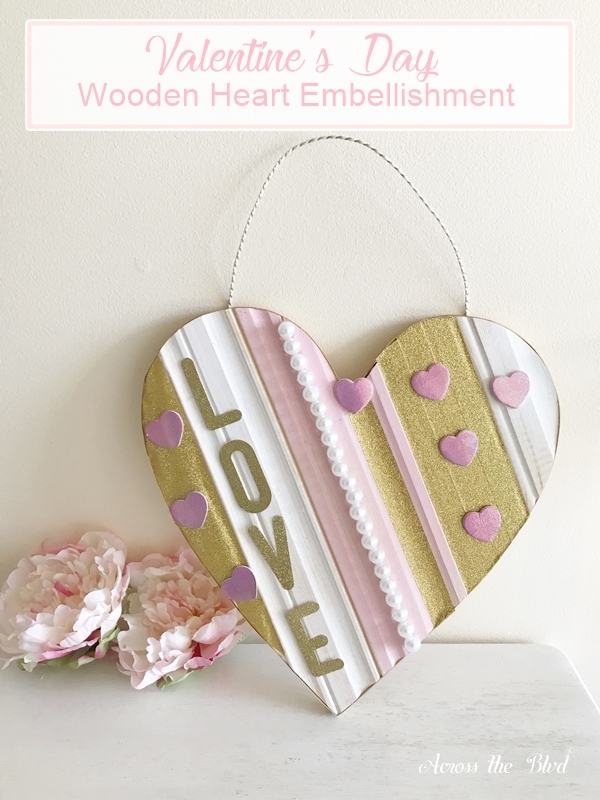 This Valentine’s Day Embellished Wooden Heart is an easy way to get the look I’m going for this year. Each year, I like to make the dinner a special occasion with a pretty table setting and decor. I change up the look of the decor from year to year. I always enjoy deciding on the look for the year and adding in hearts that go with the overall look. Last year I found a hanging heart that was canvas on one side and chalk board on the other. I made a Hidden Messages Valentine using only a few additional items. The dollar spot at Target is one of my favorite places to find inexpensive wood craft items. As each holiday or season comes around, there is always something that catches my eye. This year it was this white and pink heart. I love that the white and pink are already there-less painting for me. In fact, once I started working with the heart, I decided not to use any paint at all. 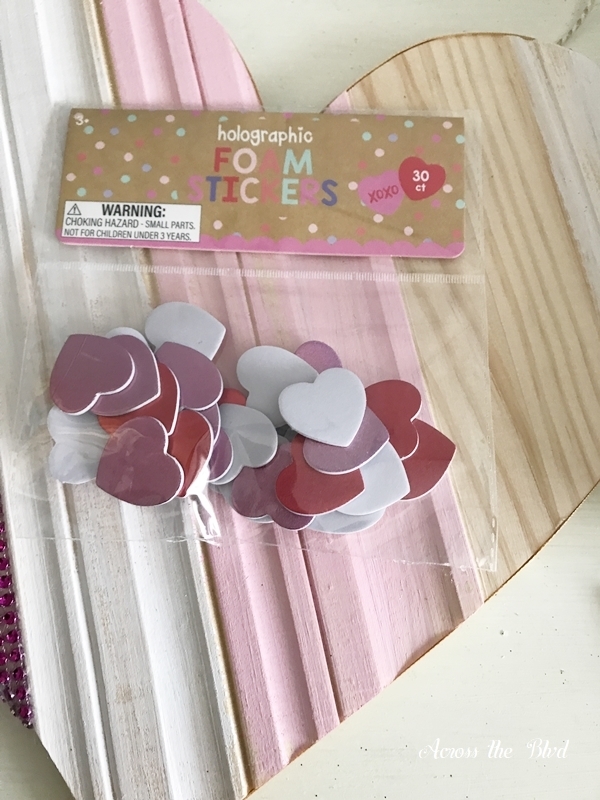 I bought a couple of packages of foam heart stencils at Jo-Ann’s. 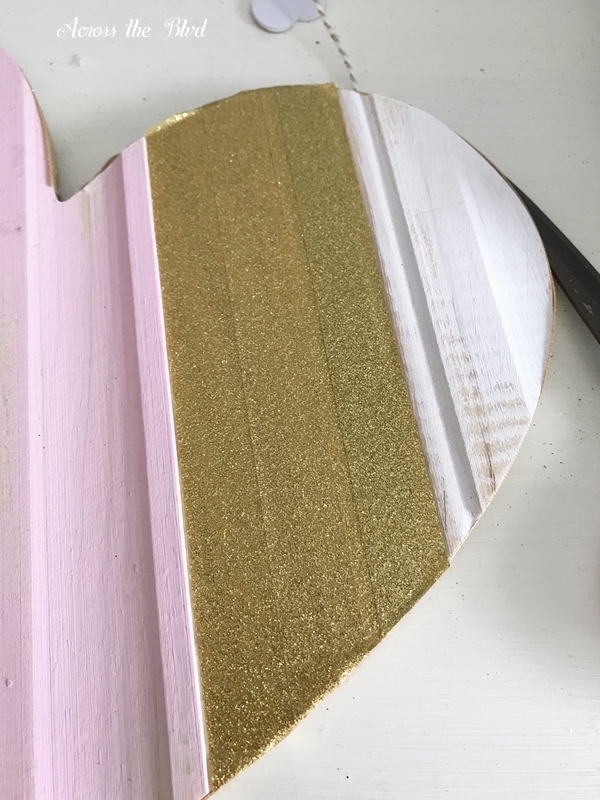 Instead of painting, I used washi tape and ribbon to add gold to the heart. It’s overlapping and pressed around to the back of the heart. 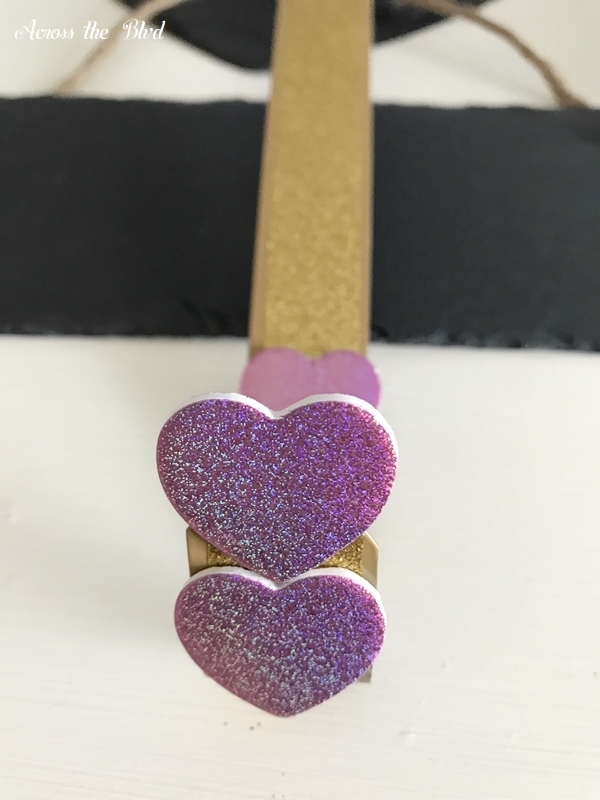 Using white craft beads to add some dimension to the heart was the result of me sorting through my craft stash, finding a bag of the beads, and thinking, oh, here’s an idea! 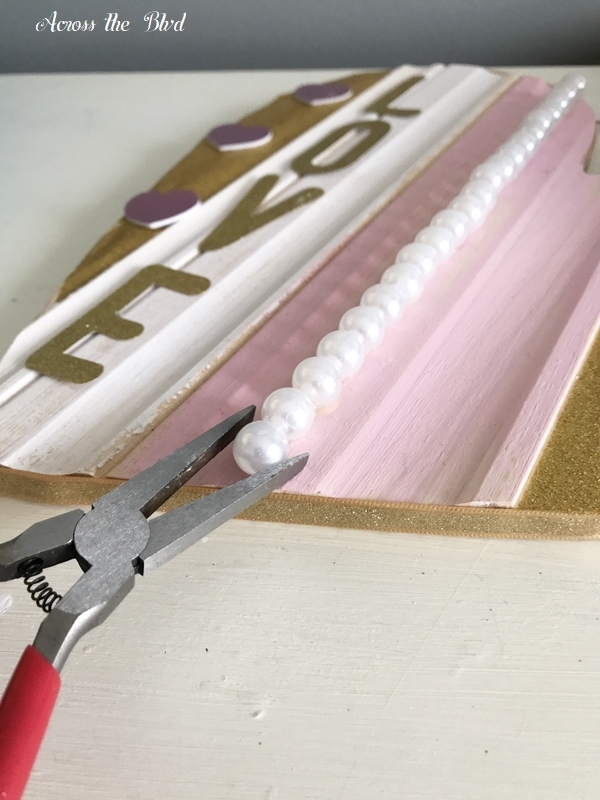 The beads are hot glued into one of the grooves of the heart. I used jewelry pliers to place them to avoid burning my fingers. When sorting through my craft stash, I also found a package of gold adhesive letters that I’ve used for a few other crafts. The letters didn’t adhere to the uneven wood, so I added a tiny dot of hot glue under each letter. 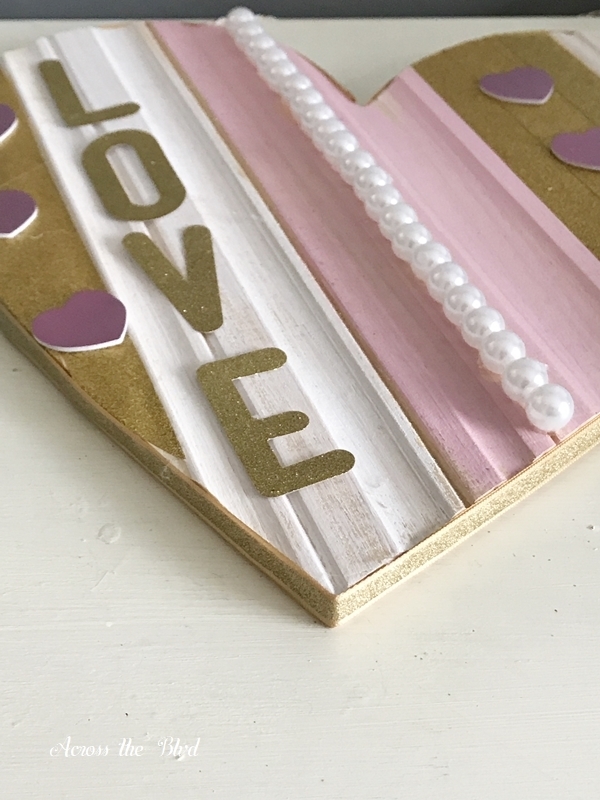 To cover the tape as it wraps around the heart, gold ribbon is glued around the rim of the heart and hot glued in a couple of spots along the way. I added a few of the heart foam stickers to the heart and also added some onto the wreath hanger along with a strip of gold tape. The heart was $3 at Target, the foam stickers were $1, and I had everything else on hand to make this Valentine’s Day Embellished Wooden Heart. This took less than thirty minutes to put together and some of that time was spent sorting through my craft supplies. This will be a pretty addition to our Stay at Home Valentine’s Date Night. Thanks so much, Marcelle. Time is flying by! I’m delighted to have sparked some inspiration for you! Thanks for subscribing. The blog subscription party I joined at Marilyn’s Treats was such a great idea. I’ve subscribed to your blog as well and I’m looking forward to following you. I’m always happy to find new recipes! Beverly, The gold washi tape was a great idea! I love the Dollar Spot at Target too! This turned out really cute and what a fun quick project! Pinned and shared. Thanks! Using the tape instead of painting sure made it easier and there wasn’t any clean up involved. Yay! Thank you for sharing! Very cute and love the color combination. visiting from Snickerdoodle sunday party. Thank you, Victoria. I’m loving this color combo for this year’s Valentine’s decor. What a pretty heart. Adding the gold washi tape really sets it off. Beautiful. Thanks, Debbie! 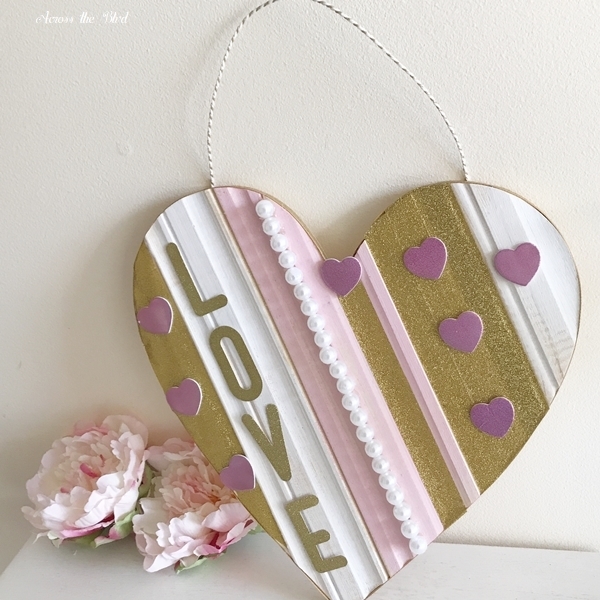 Using washi tape was such an easy way to add to the look of the heart. Very pretty . Colors work well together. Thanks! I like the softer colors, too. This is beautiful! What a refreshing change from the glaring red and white we usually see this time of year! 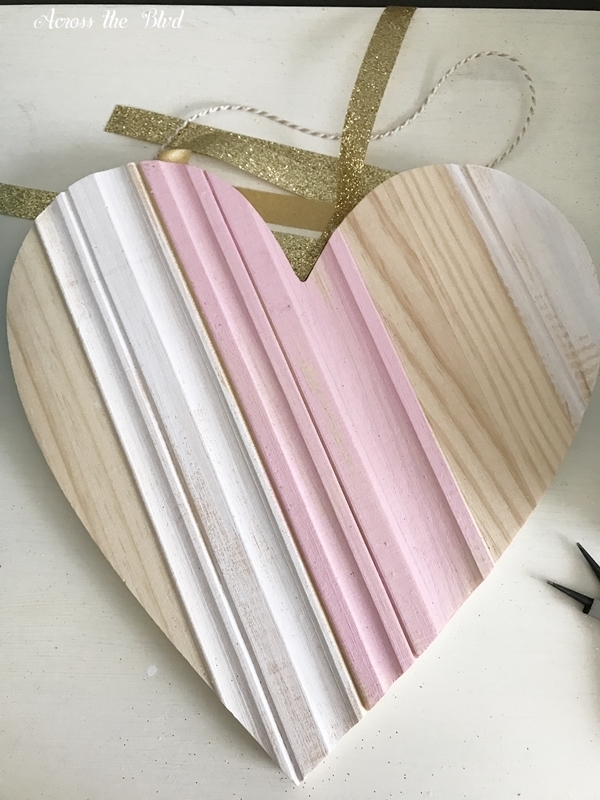 Perfect for a sweet, feminine granddaughter’s bedroom window! I’m really enjoying using the soft Valentine’s colors this year. These colors would be great for a sweet, feminine look. Thanks, Joyce! That $1.00 section at Target is so much fun to browse through. Your heart decor was perfect for the colors already present in the heart. And as others have commented, I also like the more subtle colors this year. Thank you for sharing on Party in Your PJ’s I pinned to my Valentines board. I love the dollar spot at Target! Thank you, Teresa! Thanks for the party and the pin! 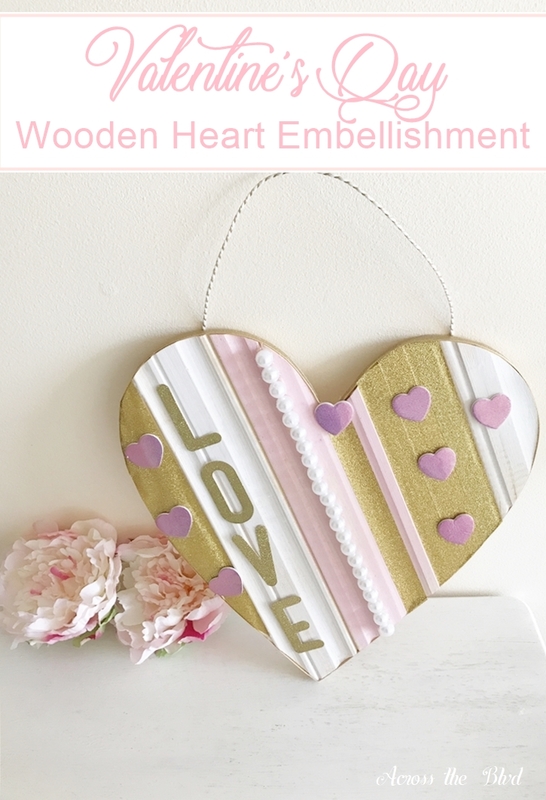 I love the heart and pink& white go so well with the gold so pretty! Thank you, Deborah. I’m enjoying using lots of pink and gold this year for Valentine’s Day. Beverly this is really beautiful. sO MANY COLORS AND TEXTURES. a VERY SWEET CRAFT! Thank you, Mary. I loved that I found the heart and just had to add a few touches to get the look I wanted. This is super cute and so easy to make – even i could do this. thanks so much for sharing at #blogginggrandmotherslinkparty. have a great week! Thank you, Sue. I love finding easy ways to make things fit in with my decor. Thanks for the party!